Soni Ji Ki Nasiyan, Ajmer: Soniji Ki Nasiyan also known as Jain Temple, is an architecturally rich Jain temple in Ajmer city. It was built in the late nineteenth century. 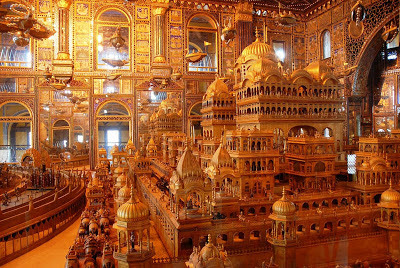 The main chamber, known as the Swarna Nagari "City of Gold", has several gold-plated wooden figures, depicting several figures in the Jain religion. Built during 1864-95 by Gauravji, the Nagar Seth of Ajmer, this temple has a stunning display of art, which attracts the tourists, devotees as well as connoisseurs of art. After the temples of Ranakpur and Mount Abu, Nasiyan temple is regarded as one of the best Jain temples in Rajasthan. Centrally located in Ajmer, the temple can be reached easily from anywhere in Rajasthan. Nasiyan Digambar Jain Temple is dedicated to Lord Adinath, the first Jain 'tirthankara'. The two-storied structure of Nasiyan Temple is divided into two parts, where one is the worship area comprising the idol of Lord Adinath and the second is the museum including a hall.